Two Nerf-branded products that fail to deliver. There is no shortage of Nerf-branded products on store shelves today, from cameras to cell phone cases to shoes. And although your editor has a degree in advertising and spent nearly two decades in the business, virtually anyone with a degree in marketing or business studies knows that over-extending a brand can be dangerous. But today we’re focusing on two specific examples of why this level of brand extension can be problematic. And, for the first time since the launch of this website, we’re issuing a “Do Not Buy” recommendation to our readers. First, let it be said that we have nothing against Hasbro wanting to extend the Nerf brand. It’s like Porsche deciding to sell SUVs… these rolling behemoths provide the revenue necessary to continue development of increasingly expensive and exotic sports cars. And if selling non-blaster, non-sports Nerf products allows Hasbro to continue developing more complex and high-performing core products, then we wish them all the success in the world. But selling poor performing goods that don’t adhere to any of the core Nerf brand values is another story altogether. …during the course of reviewing so many high quality Nerf products, we felt the difference in performance between the good quality Nerf items and the poor quality items was so distinct, it would be a disservice to our readership not to at least provide some form of communication on the matter. But first, allow me to provide some context. 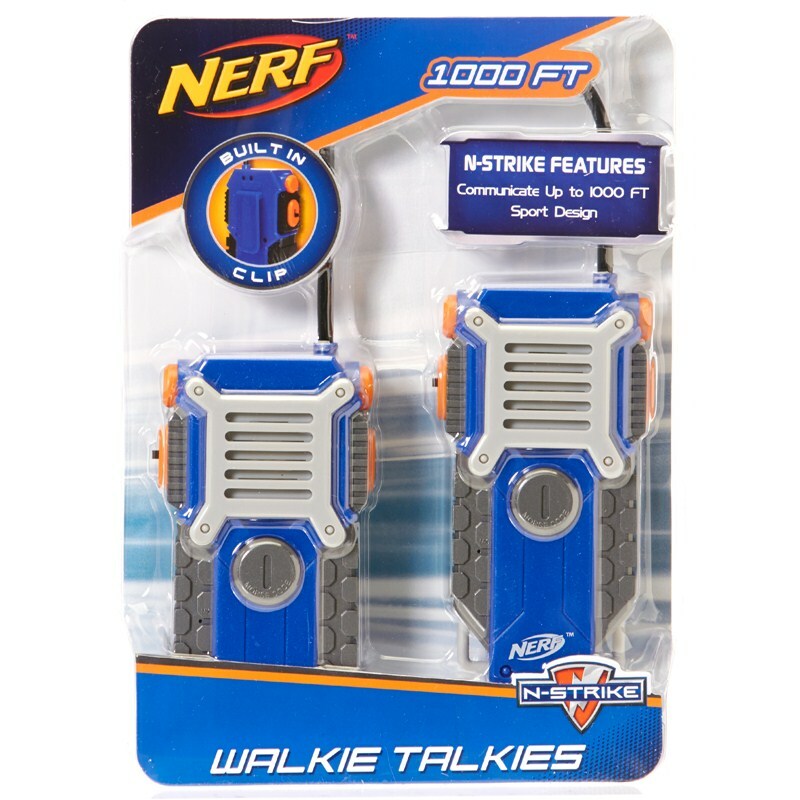 Over the holidays, we purchased two items for which we had specific uses: a Nerf Single Blockade for use during an office party, and a pair of N-Strike Walkie Talkies as gifts for one of our team member’s two nephews. We didn’t specifically purchase them for review, so this is not a formal test. Nor did we even plan on even mentioning them on this website. 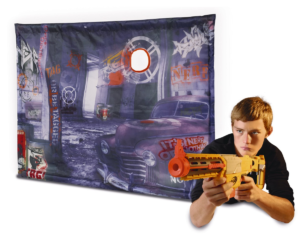 Nonetheless, during the course of reviewing so many high quality Nerf products, we felt the difference in performance between the good quality Nerf items and the poor quality items was so distinct, it would be a disservice to our readership not to at least provide some form of communication on the matter. And ultimately, our experiences with both products was poor enough for us to feel a warning to our readers was warranted. *Image is property of Hasbro. At roughly $20.00 per pair, these Elite-branded, “1,000 foot range” units seemed like a reasonably good purchase. But as we quickly discovered, not everything with the “Elite” name performs at an elevated status. Upon opening the package, we noticed that the headsets were largely constructed of hard plastic, with nary a trace of the trademark Nerf foam in sight (or feel). They have belt clips, but those are largely pointless because the handsets are too large and heavy to clip onto anything but an adult-size belt (remember, these were purchased for children, which we presume is the target market since most adults would simply rely on cell phones or high quality units from Midland, etc.). And while these units physically resembled models that adults having grown up in the 1980s might recall, it turned out they performed that way, too. The walkie talkies emitted a constant hash of background noise so strong, it was difficult for the children to hear each other, much less carry on a useful conversation. The range of the units might well be 1,000 feet as advertised, but using them at even 100 feet was so difficult, it wasn’t worth trying to find out. Sure, it could be that these units were defective, but the fact that they perform exactly like similar-looking units from 30 years ago tells us they’re working as intended, to a specification that apparently hasn’t changed in decades. And that’s the problem here—these units were clearly built to a price based on ancient technology (in an overseas factory run by Hasbro’s partner, Sakar International), and not to a proper Nerf standard. In so doing, they lose any hint of being a true Nerf product, much less one with the “Elite” moniker. They don’t perform well, they’re ergonomically challenged, they don’t utilize the ubiquitous Nerf foam, and they don’t even take their end-users (children) into consideration in form or function. At the original $19.99 asking price, they are an incredibly poor value. And even at the discounted price of just $7.99 a pair we saw over the holidays, they are still no bargain. 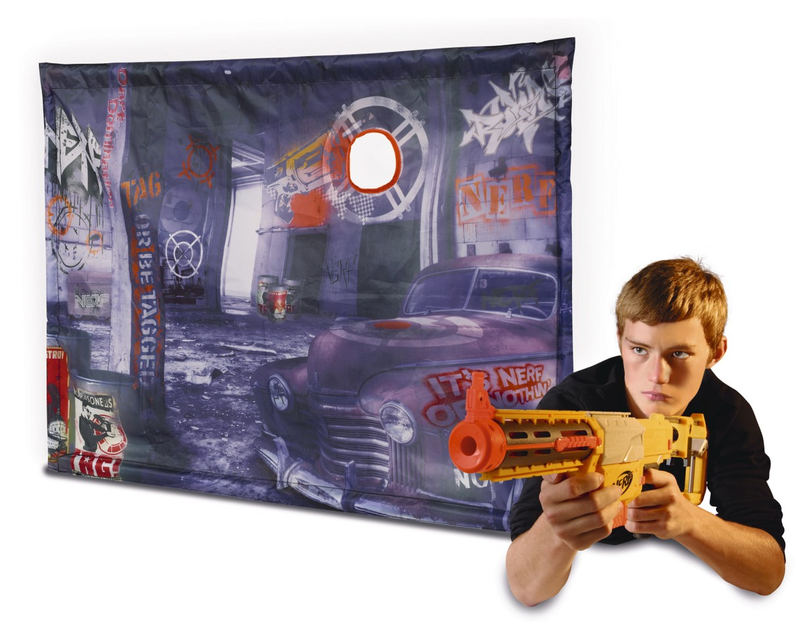 Retailing for $19.99, the Nerf Single Blockade is a thin, polyester “wall” roughly 40” wide by 28” in height. This barrier also has a small hole to shoot through, and a dart-holding pocket on the back. A thin, plastic frame is intended to keep it open and upright. It is meant to be planted in the ground outdoors, and no form of base is provided for indoor deployment. In use, the blockade was surprisingly small (as in, smaller than your living room TV), with a poorly printed fabric loosely supported by a frame that refused to stay straight. The blockade didn’t actually rip or tear or completely fall apart, but we only used it once because it was so small, and so much of a pain to keep upright and open. This unit is another “made to a price, not a standard” item constructed by a company called Worlds Apart. We say, avoid parting with your money on this poorly constructed accessory—especially at the asking price. We really like the idea of the Nerf brand being extended beyond blasters and balls. However, it has to be done right… and clearly, these two products aren’t right. In fact, they’re borderline terrible—poorly made, under-performing, and not worth the price (even on sale). When you can buy an awesome performing blaster WITH ammo for half the price of one of these cheaply-built products, clearly there’s a problem. We only hope Hasbro understands how much the Nerf brand is truly worth, and either discontinues or improves upon products like these before they do further damage to the brand they’ve spent so much time, effort and capital to create. This entry was posted in Throwback on January 31, 2014 by PMindemann.